Is this Thailand’s most romantic hideaway? Poolside pavilions at The Sarojin resort in Khao Lak, Thailand. I’ve got a theory when it comes to Thai resorts. If the welcome drink is delicious, the stay will be good. So I’m pretty pleased that The Sarojin’s welcome drink tastes marvellous. In fact, once a week the resort hosts complimentary sunset drinks, and fortunately for us our arrival was impeccably timed. A few hours after our smooth, unhurried check-in we find ourselves sipping yet another welcome drink, followed by a few more, these ones of the rather more potent variety. My welcome drink theory is proved correct. The 56 residences are housed in seven separate buildings that are scattered throughout the sprawling grounds. 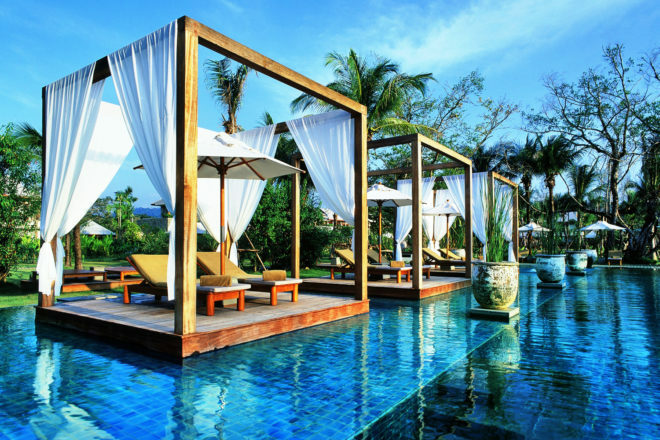 As we’re here for our honeymoon, we’ve booked The Sarojin Suite (top floor, baby) for the length of our stay. The room is seriously huge. One hundred and fifty square-metres huge. The spatial generosity is enhanced through balanced proportions and a fresh and simple colour palette – soft beiges, dreamy creams and natural browns. Hard wood floors complement the contemporary feel in the lounge room and the king-sized bed is just the right level of softness for a comfortable sleep (and beautifully decorated with an elaborate flower arrangement for our first honeymoon night). A pebbled floor takes you through to the modern bathroom where there’s a deep stone bath (that’s scattered with rose petals and lit with candles during turndown service) and a spacious rainfall shower. We spend most of our days lazing by the pool or on the beach, taking leisurely dips at the appearance of the merest bead of sweat, and returning to our sun beds to find our water glasses replenished. The staff is always on hand yet never intrusive. Each one looks genuinely happy to be there. Breakfasts are all-inclusive and à la carte with no scheduled times. Whether you turn up at 8am or 2pm, whatever menu item you select is cooked to order. I quickly learn that serving sizes are smaller than I’m used to, although it does say the menu is designed with the idea of ordering a few dishes. But as with any extended stay you become accustomed to the differences: after receiving one egg with one piece of toast on the first morning I start asking for two; an easy issue to resolve. a low-season rate of $285 per night including breakfast.